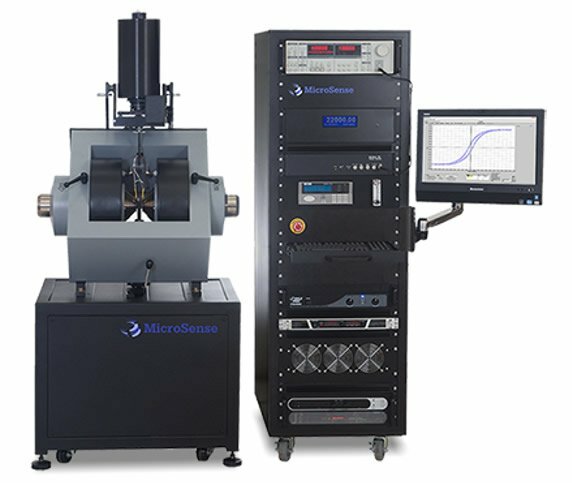 MicroSense offers true torque magnetometers both as an option to the EZ Vibrating Sample Magnetometer (VSM) systems and as a standalone system (ET7, ET9 and ET11 systems). Unlike other measurement systems that strive to determine torque and anisotropy from vector VSM systems, the MicroSense Torque system actually measures the force (torque) on the magnetic sample and from that it accurately determines the Magnetic Anisotropy. A vector VSM based system attempts to calculate the torque from the Y signal (the signal perpendicular to the field) from the vector coils. A fundamental problem with that approach is that as the sample approaches saturation, the Y signal becomes very small and prone to errors. As a result the MicroSense true Torque Magnetometer is more than 10 times more sensitive for measuring torque than the vector based systems offered by the competitors. Furthermore, because no field can be applied in the Y direction, the Y coils are always calibrated indirectly and less accurately. If the sample is measured on a perpendicular (or vertical) sample holder, an additional problem occurs in vector coil based systems: Because of the rotation asymmetry of the sample, the sensitivity (and sometimes also the background signals) become a function of the angle. All of this leads to a complicated calibration procedure. In a true Torque magnetometer, the calibration is a very straightforward and quick procedure that uses a calibration standard with a known torque value. In the ET Torque Magnetometers, you can use samples of 10x10 mm or even larger if needed. In most chip based torque measurement systems, the sample size is restricted to for example 1.5x1.5 mm. While to noise specification of the ET system is approximately 2x better than the noise specification of the most common chip based Torque Magnetometer, because of the possibility to use a much larger sample, the effective Signal to Noise Ratio (SNR) is many times larger. Unlike many traditional torque systems that suspend the sample from a very fragile wire, in the MicroSense VSMs the sample is suspended from a robust ultra low friction bearing that allows easy sample changes without the risk of breaking the sample suspension with every sample change. The most typical configuration, the ET9, can reach fields up to 28 kOe at a sample space of 10 mm with the standard 50 mm pole faces and above 31 kOe with the optional 25 mm pole faces. This is 10 kOe more than can be obtained with vector based torque magnetometers using a magnet that is 3 times the size (weight) of the ET9 magnet. Competing vector based systems using a magnet similar in size to the ET9 system can only reach a maximum field of 12.5 kOe, much too low for many modern materials. If needed an even higher field can be obtained using special alloy pole faces. Alternatively, with the ET11 system fields above 34 kOe can be reached. The Torque magnetometer model can measure solid, bulk, and thin film samples and is supplied with sample holders for all these types of samples. The excellent real world low noise performance make this torque magnetometer the perfect choice for samples with a low torque. Due to a highly efficient magnet power supply design, no water cooling is needed for the electronics. Because of this, the Torque magnetometer can operate at a medium duty cycle or at low fields without the need for a water chiller. For many measurements this eliminates a source of acoustic noise from the lab environment. Also, removing water cooling from high power electronics makes this system inherently safer than water cooled power supply designs. Included with the system are all the options needed to run including the EasyVSM software which is easy to use for simple measurements yet powerful enough for the most complicated measurements.